Fairness. Respect. Excellence. Our UNAC/UHCP bargaining teams met with Kaiser management in Anaheim this week to continue negotiations for new local contracts—and to lay out our vision for needed changes in all six contracts. Some of our groups won important tentative agreements that moved us all closer to strong local collective bargaining agreements. This is the second session and talks are in early stages, but our teams kept management focused on many issues that matter to you: working conditions, fair scheduling, and the highest standards for professional training and patient care. “The great thing about bargaining is that we are able to voice our members desires, and what they want to see in a new contract,” said Javier Rodriguez, emergency room RN and president of Kaiser South Bay Healthcare Professional Association (KSBHPA). Union observers again attended to show support for the teams. Sixteen days have been set aside to negotiate our local contracts. (National contract coordinated bargaining with the rest of the Alliance unions resumes on August 28 and 29.) Local bargaining is scheduled through September 12, with most of our contracts expiring on September 30. No doubt as our local talks continue, the issues on the table will get thornier and management pushback will increase. This is why we need you: observing at bargaining, sporting our colors on Blue Days, engaging on social media and conversation in your workspaces. We are all united as one union with common interests and we support one another. And we know that bargaining is serious business, but we need you to go viral with a unique callout to Kaiser. On July 31, we announced our #ShiggyChallengeRemix. We recorded our version of Drake’s hit song In My Feelings, asking “KP, do you love us?” and telling everyone that “We are the heart of KP.” Watch the video here and learn how to take the challenge today. Post your own Shiggy challenge video to the Heart of KP page to let our patients, our communities and our employer know how dedicated—and talented—we are. 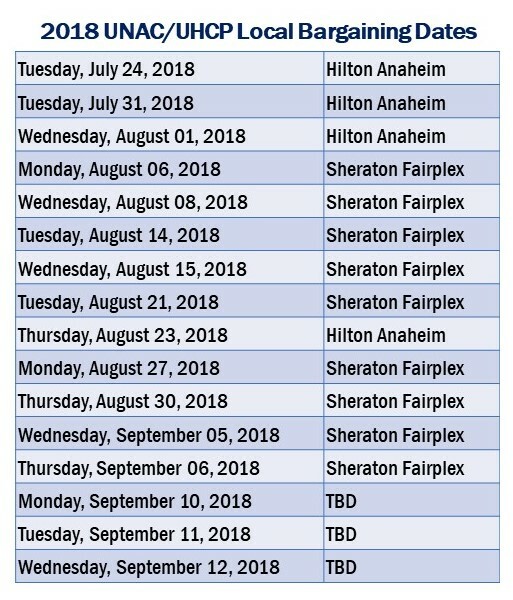 August is a big month for local bargaining; our next dates are Monday, August 6 and Wednesday, August 8 at the Sheraton Fairplex in Pomona. View the full schedule below.